So, you think keeping your valuables and extra cash in a bank safe deposit box is safe? Well, think again. 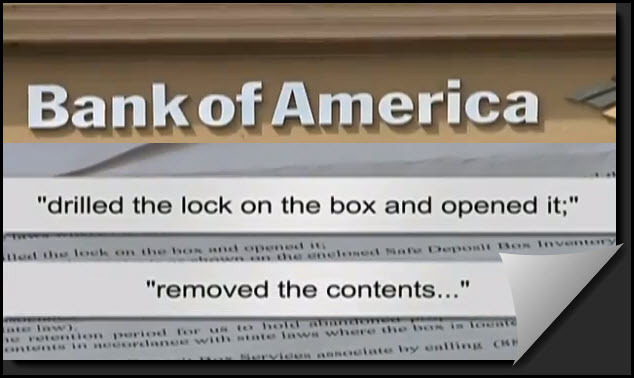 Bank of America drilled open a customer’s safe deposit box, removed the contents and shipped it to their corporate holding center across the country in South Carolina. DANVILLE, CA (CBS 5) Carried the story and stated that many consumers often use store valuable possessions in safe deposit boxes assuming it’s secure, but a Danville, California couple found that’s not always the case. CBS Channel 5 on San Francisco reported that Unsa Kamal and her husband Aizad received a letter from Bank of America informing them their box had been drilled opened and emptied. The Kamals said they thought it was junk mail; however, after carefully reviewing the letter, the Kamals said the bank “in fact emptied their safe deposit due to lack of information.” “They claim they didn’t have Social Security numbers, which is not true,” Aizad Kamal said. When they open the account that’s something very basic they ask for and they have that.” [Read the full story on CBS 5.] Foreclosure victim know just how invasive these banksters can be. Is it even a wonder that they would break into your safe deposit box when we know they trespass on your property and break into your home? Amazing that the bank had their mailing address, certainly a phone call or letter BEFORE Bank of America raided the safe deposit box would have been more appropriate. Apparently, these bank boxes can’t be called “safe” anymore. This entry was posted in Uncategorized and tagged "Bank of America", Bank of America drilled open a safe deposit box, Foreclosure, safe deposit box, thieves by Deadly Clear. Bookmark the permalink. OMG. When you think that things can’t get worse. Can you feel safe having a safe deposit box at a bank???? It’s sickening that there are so many folks attempting to make money off of the already duped American public by attempting to explain what happened. Most of these “experts” know what is happening, what happened, and that it’s useless to fight. Seminars, books, expert witness, securitization audits– All of their shenanigans are bull kaka. They are no better than the Wall Street securitizers, bankers, mortgage schemers and accountants that dreamed up the complicated mess. When the cow poops, the worms come out to eat it. Why not just tell folks exactly what this is? The government is seizing our homes. The government took the title to your home and put it in trust for bonds and those bonds were bought by the WORLD. Why do you think Obama quietly sign the martial law act on Friday night, March 16, 2012? To keep the foreigners from taking our land! We’ve stiffed them out of their money. They are pissed. Better our government seize our land than foreigners. Apparently, the distinction between renting and owning storage space is not clear. If you rent the space, you agree to play by the terms of the bank. Ignore their letters and you give them the right to drill your box. On the plus side, at least BOA didn’t have a key. It would be hard to believe that BofA didn’t have a master key. The “drilling” aspect is more for affect. They don’t have a “master” key for liability reasons. Incorrect. It is illegal for the bank to have a duplicate or master key set. It is necessary to have a locksmith come out and drill the box, knock out the existing lock, and replace it when a key goes missing. “It is illegal for the bank to have a duplicate or master key set.” Seriously, what is your point? With all of their fraudulent and illegal activities you seriously think safe deposit boxes are above the fray? The point is, Deady Clear, is that you implying that bank’s have duplicate keys is wrong. Criminal banks, yet another violation of our rights. The gov’t constantly violates our rights. 2006 Bank of America, on Continental and La Canada, in Green Valley, AZ, opened my lock box and was ready to give the contents to someone else. The only thing that stopped this action, was the person they hired to drill open the lock box. He had a bad feeling about it and gave me a phone call, telling to get down there immediately because B of A has him drilling out my lock box to give the contents to someone else. When I got there, I talked with the person who drilled it out and then to the Bank. I went back three times to talk with the President of the Branch. There was a quick overturn of people so the President and other customer service people had changed. However, One president told me that my number had the same number as another client therefore the box could be opened by him. It was a computer -or non computer glitch. All the stories given did not make sense. And the worst of it is that they each told me that this is not uncommon. If I had not rushed to the bank, or if the person drilling out the lock box had not thought of calling me, all my papers and other, would be gone, just that quick and simply. They never apologized. I got a call from my bank today in a small city in rural Kentucky. The bank representative on the other end requested that I come and retrieve my personal belongings because the bank drilled my safe deposit box open for non payment. Within minutes I found the receipt where I paid the box rental in January — this is now May. She said she has no record of the payment. I am glad I kept the receipt which has the dollar amount paid, references the box number, and the clerk’s name that accepted my rental box payment. I feel this was an illegal act on behalf of the bank. The contents of the safety deposit box are my personal effects and for my eyes only. Is there an attorney out there that can tell me what I can do about this??? I received a letter stating that the bank had drilled my safe deposit box and I could pick up the stock certificates they found after I paid an$150 drilling fee. I thought I had emptied this box in 2005 when I moved from California to Washington state. I flew down to Dana Point and went to my old bank where I had the box. The assistant manager, Rosa told me I had to call the 1-888-311-4719 number listed on the letter (8-5 Eastern time). I called that number and was told by Alicia Anderson that they cannot help me and to go to a different BOA branch. I went to the Laguna Niguel branch and I was told Fojan Minafar, the Financial Center Operations Manager that she couldn’t help me but would find out what was going on. She called next day, left a message. I called her back but I’ve heard nothing more. Hypothetically, were there valuables removed by the bank people that I have forgotten about? I was surprised to know about the stock. One of the “officers” only printed her first name on the verification form. All of this is very shady to say the least.